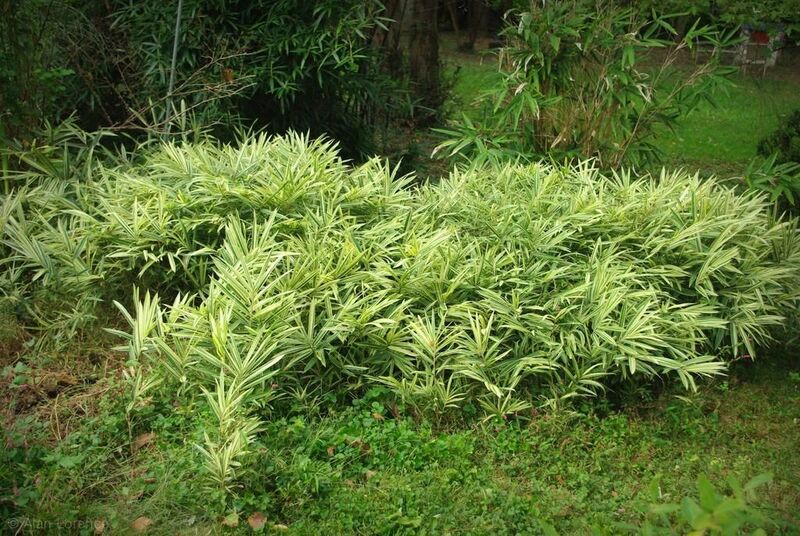 You'd think that with at least 30 in-ground plantings of running bamboos that I'd be hesitant to plant more. You're wrong of course, and having 30+ already is not a deterrent. 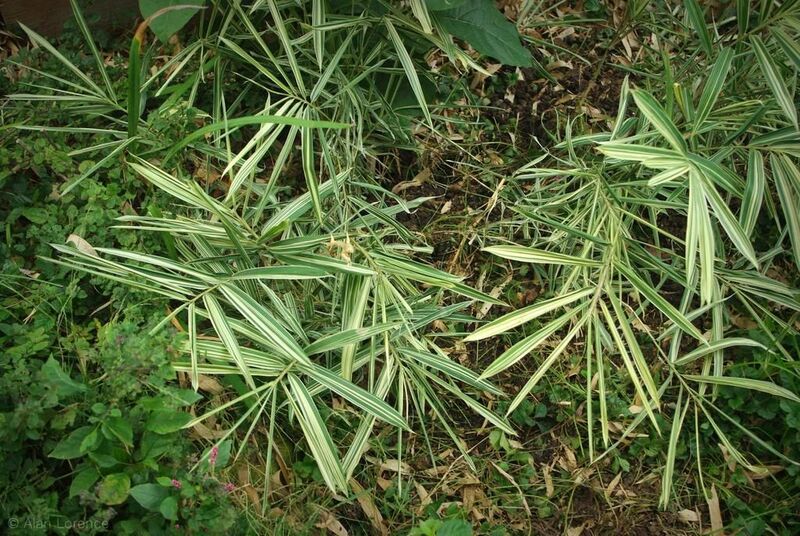 To be honest, once you plant the first running bamboo and properly maintain it every year to keep it from spreading, adding another isn't such a big deal. Then the next thing you know you have 10. Then 20. Then you stop counting. My bamboo gardening has moved from the "collect as many different species as I can" phase into the "let's divide some of my favorites and use them to fill out the garden" phase. (Of course the bamboos themselves are all in the "let's fill out the garden!" phase.) That's why I transplanted some of my Pleioblastus fortunei bamboo into a new part of the garden the other evening. The parent "grove" -- which is a strange word to use for a planting that reaches at most 24" (60cm) tall -- is really doing well, although I let it get a bit out of bounds this year. So I took a division from the back of the plant, where it was going to encroach on the bigger Indocalamus 'Solidus' behind it. I always forget how difficult it is to dig these up, as some of the rhizomes are deeper than they seem. I expect it to come out in a chunk like sod, and it might if the soil were really hard and dry -- but it's not. ...but there's still more to take out. I may just sever the rhizomes, cut down the growth, and remove any shoots that come up in the spring. I know I'll have to do that on the side closest to the rose, as those rhizomes have certainly escaped quite a distance (I'm always hesitant to dig around the rose roots too much, but I have to). 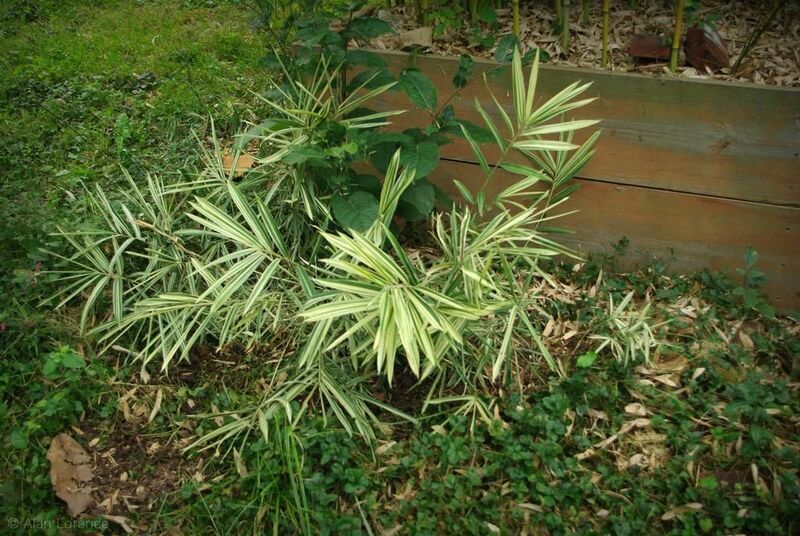 The variegation will offset the three all-green bamboos around it once the plant fills in a bit more. Although it's suffering from root loss (transplant shock), the rhizomes are fine and the plant will rebound in the spring. All of the foliage will die on this over the winter anyway, so I'm not concerned in the slightest. Maybe that should be the motto of my kept-in-check bamboo-centric garden: I'm not concerned in the slightest. 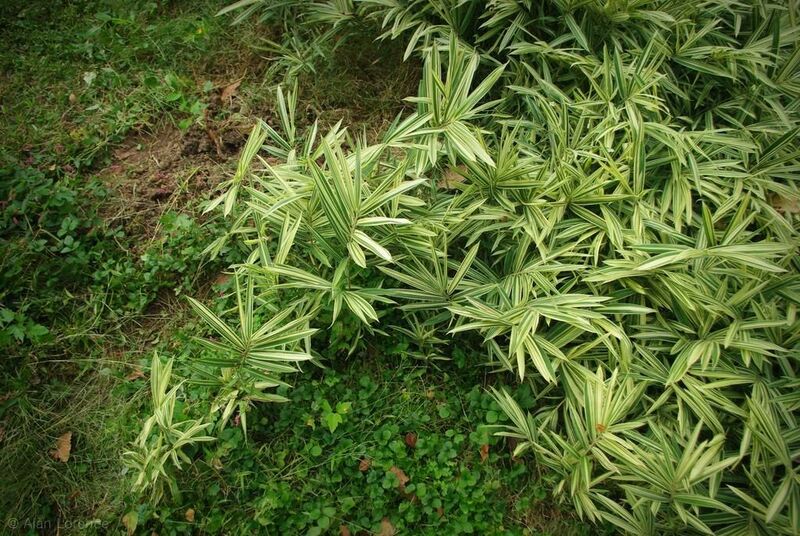 How running bamboo has not taken over the whole planet by now is a puzzler. I'm especially fond of the larger bamboos that one can walk under and my one little vivax planted 16 years ago with no barrier (eek!) requires lots of digging each summer to make sure it doesn't take over my whole (small) garden! That hasn't kept me from planting lots of other spreading bamboos. At some point, we'll just move from our properties, right? You're right, once you know how to manage running bamboos it's less daunting the idea or actually planting more running bamboos. 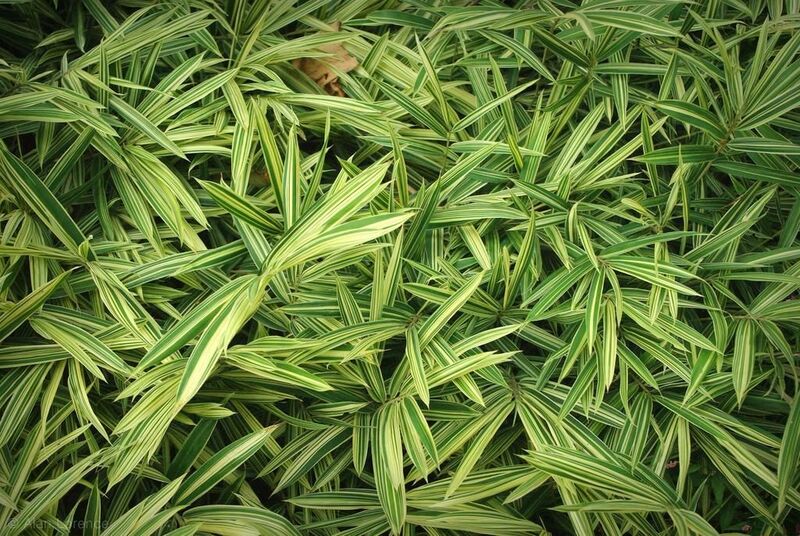 Although a runner that variegated bamboo is such a good performer and I'd say should be planted more often. Peter: Do you have a mulch-filled trench around the vivax? If not, we need to talk. 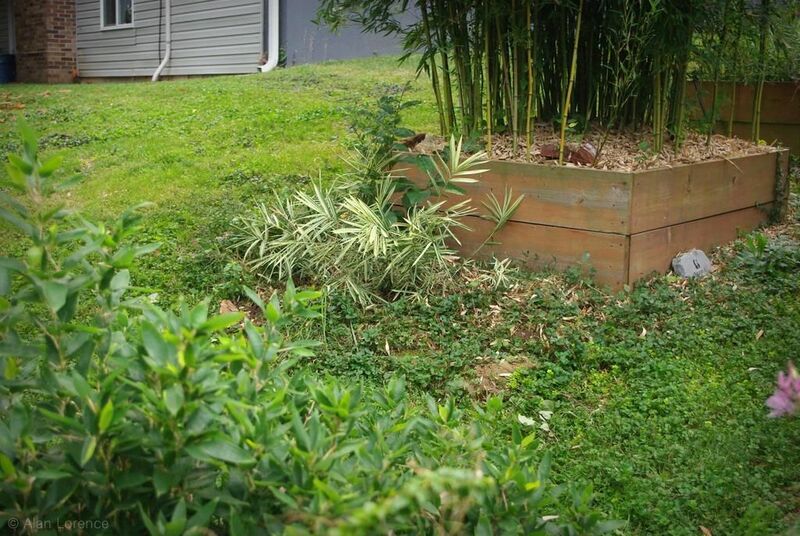 Mark/Gaz: I find myself more and more thinking "a nice patch of bamboo would look great here!" -- more to come. "I'm not concerned in the slightest" could be a great blog title. How funny that we both posted about this plant on the same day. I included a link to your post in mine so that people who are interested can learn a little more from the master. Looks great! I just love the look of this small bamboo! I am going to see about getting it in Houston. I have been using black bamboo in a few designs this year. How fun to do a small variegated. Laurin: I probably wouldn't plant it in full sun down there or it will get a bit fried looking -- my plantings in shade stay fresher looking than the ones in sun. If you're having trouble finding it locally drop me an email and I'll see what I can do.